TestingCup Helping Hand – meet our Speakers! We know that sometimes it may be intimidating to approach speakers at the conference. We also believe that events like TestingCup are perfect opportunity to meet fellow testers from all over the world and exchange experiences. This is why this year we are introducing “TestingCup Helping Hand” consulting sessions. 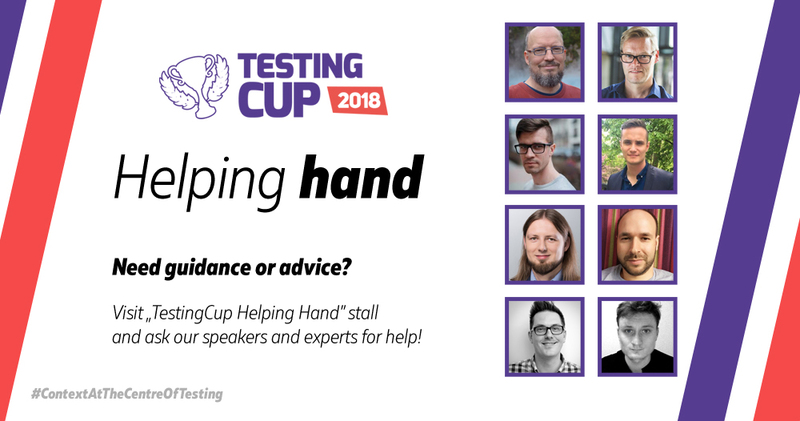 Visit Helping Hand area during TestingCup and meet our speakers (on Monday 28th between 10 am and 1 pm) or approach them anytime during the conference. Experts such as Michael Bolton & Zeger Van Hese (Exploratory Testing) Rob Lambert (Team Bulding, Communication Skills), Dawid Bałut (Security), Adrian Gonciarz & Łukasz Rosłonek (Automation), Krzysztof Chytła & Michał Stryjak (Test Team Management) will be there for you, happy to answer any questions you may have in the area of their expertise (or on other topic).